Here's another fun lunch idea. The girls gave this one 2 thumbs up and ate all their lunch. I simply used their favorite grilled panini (Muenster cheese and smoked ham...dash of mayo on whole wheat pita.) 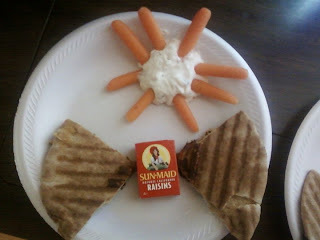 I used a miniature box of raisins, some veggie dip (which is usually bogo at Publix), and baby carrots. I just made it a little more fun by doing a carrot sun and a panini butterfly. They absolutely loved it and it's a frugal lunch on top of that!